Is this with the old Sakray download (the one before costume tab)? If so, download the 13.3 w/ costume tab one. If it is the newest downloadable Sakray, I suggest you reinstall and repatch. Well, After a new reinstall of Sakray, it still died at that file. So I commented out that one specific file. Works now. I guess whatever was in that grf is ignored so I have some things as unknown apples. i've already re-installed sakray, and yes, i'm using the newest client i could find to download..
Feel free to try what I posted earlier. Please make sure that you are not running any non-iRO versions of the game and that you are installing into a clean folder. i've gotten those same sprite errors on specific accounts, and i'm pretty sure its due to the halloween headgears that are missing from the data files. I tried to add them as attachment, but I failed at it. So tomorrow I may upload stuff. Edited by asayuu, 10 December 2011 - 08:40 PM. 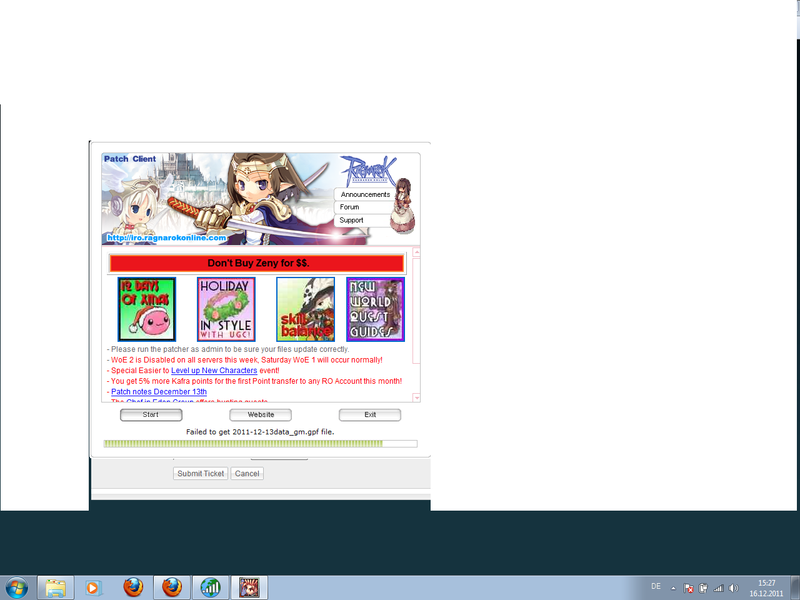 I keep getting an error that reads: Failed to unpack 2011-7-22-Sakexe.rgz file. I downloaded from irowiki.org since I had the same error with the one on the thread. The Sakray folder is not located in my RO folder. Any idea what I can do? You may have to run your patcher as admin. Make sure the folder is writable and your windows account has permission to write to it. Maybe I'm having bad luck getting this to work. Originally tried run patching from the previous working client..
dies at 99% on the 2011-12-6data_gm_sak.gpf. every time. Figured maybe it's your server files not working properly yet..
but seems some people got it working.. so maybe it's me so I figured maybe I needed to reinstall. Now instead of the above just only dying at 2011-12-6data_gm_sak.gpf ... which is pretty much a good bet how it should have been.. It now wants to redownload ALL from whatever the installer started..
waiting for it to patch up, only to get to 2011-12-6data_gm_sak.gpf (as above) and dying there.. again and again. 2011-12-6data_gm_sak.gpf dies hanging at 64337920/64338496 until it "Failed to get 2011-126data_gm_sak.gpf file." I had the same issue as Lovebane. I forced the patcher to run as admin (and XP SP3 compatibility mode) but still had no joy. Downloading the 2011-12-6data_gm_sak.gpf file via web browser and then placing it in my Sakray folder solved the problem the next time I tried to patch. I had tht same problem as atrista. How do you install sakray? do you install it anywhere or in the iRO folder? I'm lost. YEAH i have the same stupid problems. Every time i try to patch..it is stopping the patch every time at the same point...every time at 2011-12-13data_gm.gpf file. why can`t you guys make something that is working for sure?